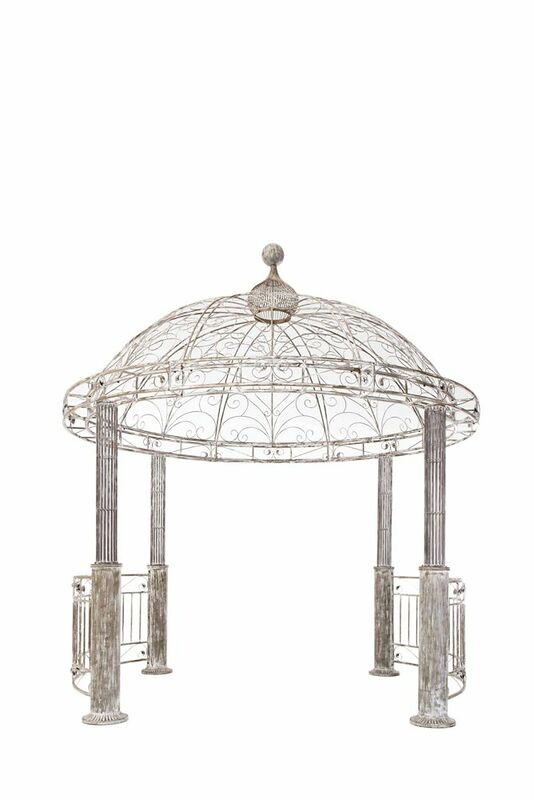 Add style and grace to your garden or yard with this picture perfect pavilion! Incredibly intricate styling on the domed roof is full of graceful curves leading up to a unique sculptured sphere makes this one of the most alluring pavilions out there. The unique scrubbed white paint finish gives this pavilion real character, a look that makes it appear vintage and antiqued. Perfect for weddings, this pavilion is as photogenic as any bride or groom! Sunjoy Ivy Pavilion with Flower Pots Sunjoy Pavillon Ivy avec Semoirs de Fleurs Add style and grace to your garden or yard with this picture perfect pavilion! Incredibly intricate styling on the domed roof is full of graceful curves leading up to a unique sculptured sphere makes this one of the most alluring pavilions out there. The unique scrubbed white paint finish gives this pavilion real character, a look that makes it appear vintage and antiqued. Perfect for weddings, this pavilion is as photogenic as any bride or groom!